- So with the wife having recently gone back to school and pretty much using the macbook pro 13-inch all the time now I really missed having a modern laptop to use. The Dell Inspiron 8600 has served me well for many years but it was time to trickle that down to the kids and look for a new laptop for myself. The macbook pro 13-inch we got last year has been overall a good experience so I was considering just getting another one. What bugs me is the refresh for 2010 didn't seem all that hot. I mean it still used a c2d cpu (no core i5) and the nvidia 320m is a pretty nice bump up from the ion but still its performance isn't what you would call exciting. I really like the 13 inch form factor though. I think it's a great compromise between size, weight, and usability. I considered the alienware m11x which has a really nice gpu (nvidia 335m) but I think 11 inches might be a tad too small to play world of warcraft on. The asus n82j, a 335m optimus based laptop, also looked interesting but is still not released in the US. In the same boat is the acer timelinex 3820tg which I really wanted but is also not released in the US. It has an ati 5650 in a 13 inch laptop. Finally, there was the HP Envy 14 which is very MBPish. It's a 14" laptop with a slower clocked ati 5650. It's also pretty pricey. I came really close to getting the envy. Then, I started looking at the macbook 15". It had the core i5 (turbo boost + hyperthreading ftw), a nvidia 330m which is about 8-10% slower than some of the other options I looked at, had good battery life, and has the advantage of being able to run osx and windows 7. My thoughts were I plan to do more coding on this laptop. With bootcamp I can have a full .net development environment setup and maybe finally get serious about iPhone development. Of course a bit of Modern Warfare 2 or wow would be nicer on a 15" screen too. I figure it might even be fast enough to use at LAN parties. - OK, these macbooks are EXPENSIVE for what you get. I felt the apple tax even more this time around. I really felt the competition was offering quite a bit more hardware for quite a bit less money. Even with the educational discount and ebaying the the free iPod Touch to help offset the cost, the cheapest mbp 15" still ran me about $1580. After reading a bunch of reviews it seemed like you go either 2.4 or the top of the line core i7. The i7 was quite a bit more than I wanted to spend on the laptop so the core i5 2.4ghz it was. This was only $80 more than what I spent on the mbp 13" I got last year. I guess if I look at it that way it wasn't that bad of a deal. - I LOVE the keyboard on this thing. I'm not sure how different it is from the 13". Maybe there is more space between the keys. Either way I found it a joy to type on. There's no flex of course. The keys just felt right size and spacing wise. I can type really fast with very few errors. I liked the keyboard just fine on the 13" but this one is noticeably better. - I forgot how much bigger and heavier a 15" is compared to a 13". It might not seem like much but after a few hours of use you really start to notice. The display and keyboard might be worth the trade off. Besides, we still have the 13" which we would bring on trips and leave the 15" at home. The extra 1.1 lbs might not sound like much but you do kind of notice it after long periods of use. - The inertial scrolling is quite nice. - Apple has it's own version of optimus with the seamless switching between integrated graphics and the 330m. It's great having good enough performance for wow and starcraft II while still getting great battery life when you are just surfing. - I stuck with the default 1440X900 screen not just because of cost but because I wanted better game performance at native resolutions. - I love how on first boot osx comes up nice and clean with ZERO crapware installed. 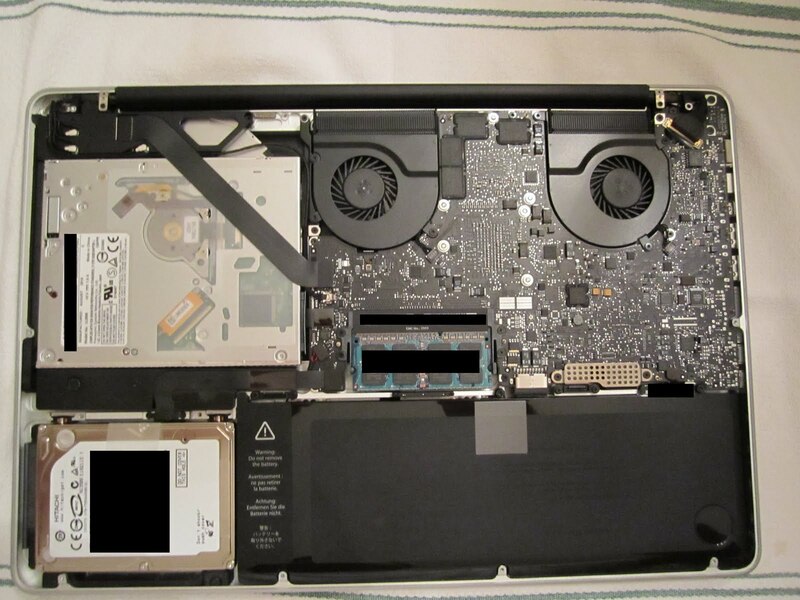 - I think I had more quirks with this laptop than the mbp 13" I bought last year. - First, I had the freezing issue. It happened during wow, in 5 man instances, and even when I'm just riding around Stormwind. The computer would just freeze up for 5 seconds or so. I also noticed quite a bit of spinning beach ball. This happened more when vmware fusion was running. It seemed like it was hard drive related. Disabling spotlight using snow leopard cache cleaner seemed to fix the issue. Later, I re-enabled spotlight, and things still seemed ok. It's all moot because I swapped out the hard drive and now things run great. You pay for premium and what do you get? A POS 5400 rpm Hitachi. I mean they couldn't even spring for a 7200rpm drive. Sheesh! - I installed steam next and got the dreaded "Could not connect to steam network." OK, this more of a steam issue than a mac one but it was still frustrating. After uninstalling and re-installing steam, it started working and I was able to download my games. It sounds totally crazy but it worked! I hope it stays fixed but so far so good. - So I pared my Razor Orochi bluetooth mouse just fine in osx. After installing bootcamp I had issues pairing it with windows 7. It would just hang on connecting. I found this interesting thread where it discussed how you have to unpair the mouse from osx first. Delete it from bluetooth devices. Then, boot back into windows and pair it there. After it is successfully paired in windows you should power down and cold boot into osx and pair it there again. Now it should work in both environment. This is another big WTF. I mean how are settings in one os affecting the other os? It makes no sense to me. - Mouse Speed Switcher is a nice windows utility to let you switch between different mouse settings quickly. This is useful if you have different sensitivity settings between the trackpad and a mouse. I still wish 3 finger gestures worked in windows. Maybe trackpad++ will add it someday. - SSD sounds so tempting but I need at least 500gb of space since I plan to bootcamp and dual boot. A 500gb SSD is like $1300. I'm not going to spend almost as much as the laptop itself on just the hard drive. Instead, I picked up one of those new hybrid drives: Seagate Momentus XT ST95005620AS 500GB 7200 RPM. It shipped with the latest firmware SD23 so there was no need to flash it. It's basically a 500gb 7200 rpm drive with a 32mb cache and a 4gb ssd. Also, it's only $130. You pay a bit of a premium for a hybrid but it's still a fraction of the cost of an SSD. At worst it performs no worse than a good 7200 rpm drive, and at best it can significantly speed up often loaded programs. Someday I'll make the jump to a true SSD but not today. 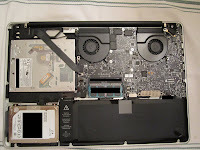 Swapping the hard drive was exactly like the mbp 13 which you can read about in my mbp 13 review. Make sure you have a torx 6 screwdriver. First, I attached the new hdd via usb. I partitioned as guid and then imaged the current hdd to the new one using carbon copy cloner. Next, I swapped the hard drives. It booted up just fine so I went ahead and did the bootcamp thing with a 300/200 split (osx/win7). The drive is quiet and fast and NO MORE FREEZING. I have no complaints. Now, I have the original 320gb hdd which I'll slap into an external enclosure and use it as my time machine backup drive. Never buy the way over priced apple upgrades for this kind of stuff. It's much cheaper and better to do it yourself. - G.SKILL 8GB (2 x 4GB) 204-Pin DDR3 SO-DIMM DDR3 1066 (PC3 8500). 8 GB of ram for $180 isn't too bad now. I think I can ebay the old memory for around $60-70 so that should help offset the cost a bit. I went ahead and bought two of these so both macbooks are now upgraded to 8gb. We run vmware fusion with win 7 32bit quite a bit so it's nice having 5 gb for osx and 3gb for win 7. Running the latest memtest86+ on the mbp 13" came out clean. When I tried it on the mbp 15" It immediately threw up a ton of errors. Apparently it's due to buggy EFI and the errors are false. Instead, I ran Remember which tested most of my memory and came out clean. I guess there's more of that apple premium experience. - I picked up some extra magsafe 85w power supplies from the ebay seller sib-usa for around $20 shipped which worked just fine. Played about 30 min in a 25 man Sunwell raid with about 18 people. I forgot to look at the fps but it felt fine. No problems raiding on this laptop. - Starcraft II: 28-30 fps. A tad low but playable. Overall, I'm satisfied with the purchase. Once you spend way too much time researching and working around all the quirks in the system it's actually a very nice laptop. Is it me or is Apple getting more and more sloppy lately? Anyways, recommended if you don't mind the sticker shock or getting your hands a bit dirty to get things tweaked and working the way you want it to. Honestly though if you don't do any osx/iOS development, I would probably not recommend a macbook. There are perfectly good alternatives out there for a lot less money.